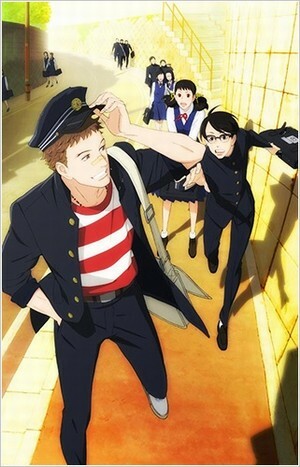 Plot Summary: Because of his father’s job situation, freshman high school student Kaoru Nishimi moves by himself from Yokosuka to Kyushu to live with relatives. Until then, Kaoru was an honor roll student who tended to keep to himself, but meeting notorious bad boy Sentaro Kawabuchi starts to change him. Through his devil-may-care classmate, Kaoru learns the attractions of jazz and finds the first person he can call a “friend”. He also discovers how much fun it is to play music with a pal. Other characters include Sentaro’s kind childhood chum, Ritsuko, who is the daughter of a record shop owner; the mysterious upperclassman, Yurika; and Brother Jun, the much-admired leader among their peers. Set against the backdrop of a seaside town with a scent of American culture, this series is a drama about young people coming into their own, crossing each other’s paths, and finding friendship, love, and music!